The biggest challenge of staying in an RV? Kayla and I got sick of all the clutter, so we scoured the internet to find the best RV storage ideas of all time. 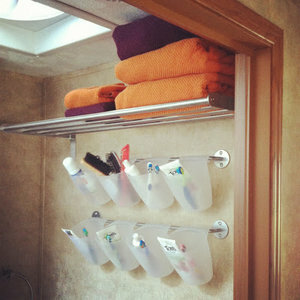 In this post, you’ll learn how to organize your RV (or small space) today – and keep it that way! Note: Some of the links in this article are affiliate links, which means we make a small commission if you buy something. You don’t pay anything extra by purchasing through these links. See our disclaimer for more info. Thank you! Write down everything you have. I know, this is a monstrous task, but there really is no better way to organize your RV or small space than by knowing exactly what you have. Do you really need 12 drinking cups and 20 plates? Unless you have a huge family, I doubt it. I’m a culprit, too. I have 3 pairs of sunglasses. I don’t need them, but… y’know. Everyone has those things they just don’t want to get rid of. As fulltimers, we plan to get rid of everything we don’t use at least once per year. 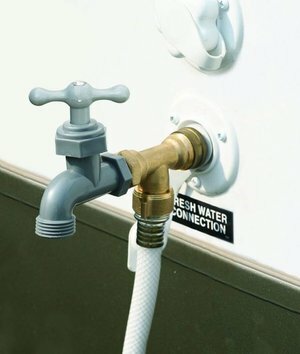 If you’re not living in an RV, I recommend doing this after every RV trip. And I do mean everything. Keys, your fly swatter, loose change, bike helmets, the RV trash can — you name it. 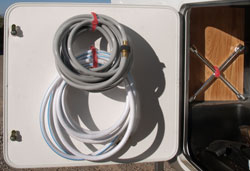 It’s the only way you’ll ever get your RV to stay organized. If you bring a new sweater into the RV, an old sweater should be removed. The key to saving space in an RV or tiny home? Use the ‘one in, one out’ rule. With a house that moves, you have to put everything away before you start your drive. However, when you stay in one spot for any length of time (we sometimes stay at one site for over a month), daily cleaning can be overlooked and clutter builds up. No amount of RV storage ideas will help you if you don’t develop a routine. We have a daily morning routine of cleaning up after breakfast. Once we’re finished eating in the morning, Kayla and I like to take 20 minutes to wash the dishes and pick up anything lying around. By doing a small pickup session daily, the cleaning is more manageable and never becomes a huge hassle. Now — on to the RV storage ideas! 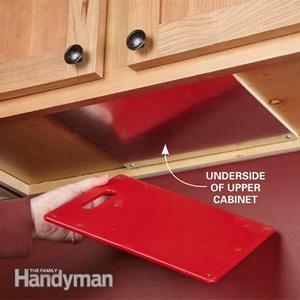 These cabinet-sized drawer units are pricey, but if you have the money they can be one of the best ways to use RV cabinet space that may otherwise be wasted. Kayla and I don’t use them because of the price, but we’d love to have them if we had the extra money! 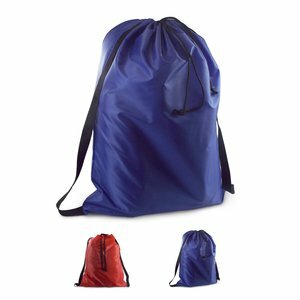 Secure them with bungee cords to keep them from opening on the move. 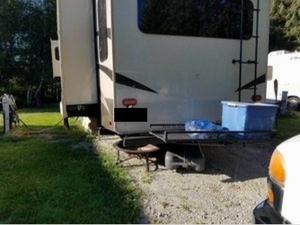 An RV trash can on the floor takes up a lot of space… but you need a trash can. Trust me – Kayla and I went weeks without a trash can in the RV and it’s a huge pain. 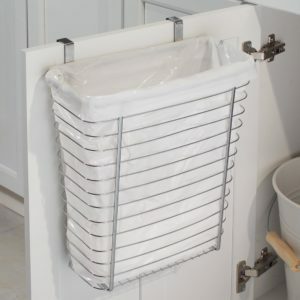 This over-the-door trash can saves space and is totally out of the way! 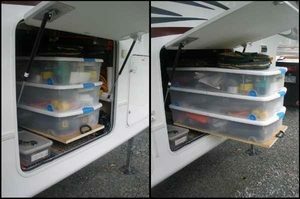 Storage bins are probably the number one most important piece of the RV organization puzzle. We have a dozen, and could probably use two dozen more. 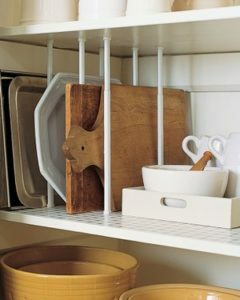 You can use them in cupboards, drawers, and in the outside storage compartments. Label them for bonus points! 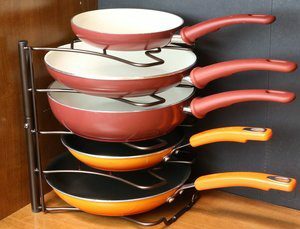 Cookware can be the biggest space sucker of all the items on your RV. 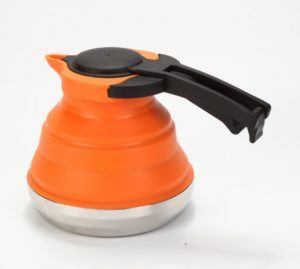 If you like to heat your water with a kettle, getting a collapsible tea kettle will save you a lot of room and headaches. 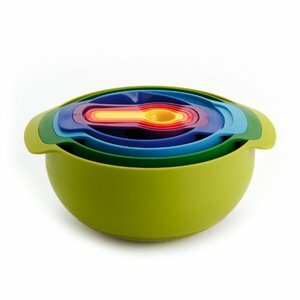 You can also get collapsible colanders and even collapsible pots! Nesting bowls are a go-to RV space saving idea. We basically stopped using bowls in the RV until we found these because they just take up so much room. One of those “bowls” is actually a colander, which is great. These are way up on our wish list. 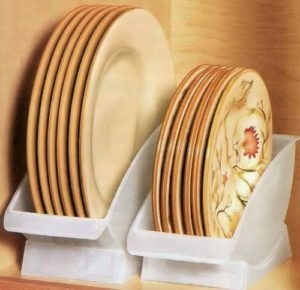 Stacking dishes vertically in a dish cradle makes them take up less space and, more importantly, makes it easier to get them out without needing to take anything off the top of them. If you can find a spot to put a hanging basket, they’re great. Kayla and I don’t really have anywhere we could put one, so unfortunately, we don’t have one. 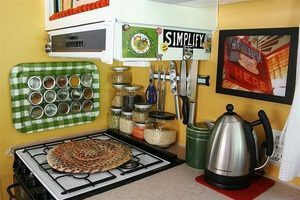 Having an above the sink rack, rather than a countertop one, frees up that precious counter space. This model even rolls up for easy storage. We don’t have a spot for one of these ourselves, but I wish we did. 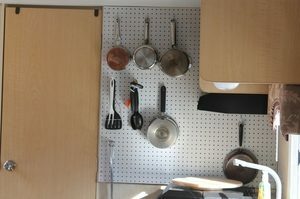 A peg board on the wall looks like a really cool, easy way to organize the unorganizable: pots and pans. 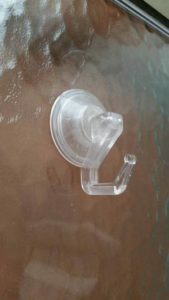 The suction cup hook pictured above is from our shower, and this thing works wonders! I love anything you can use to hang stuff without putting holes anywhere because we’re planning on selling our RV when we’re done and want to keep it’s value. 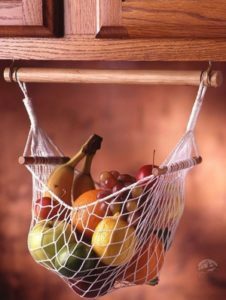 If you’re like us and can’t find room for the hanging baskets, these fruit hammocks might work for you instead. I like them because the fruit ripens evenly so you don’t get spots over-ripened. Another item high on our wish list is this awesome paper plate dispenser. GENIUS! 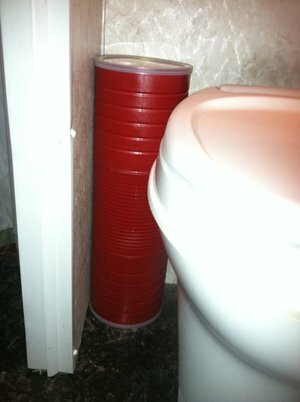 Use a paper plate dispenser to save counter space! 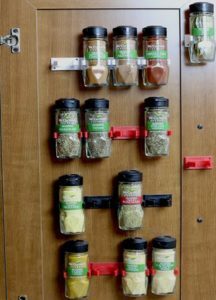 This spice rack can be installed right under a cabinet and will save tons of RV cabinet and counter space. 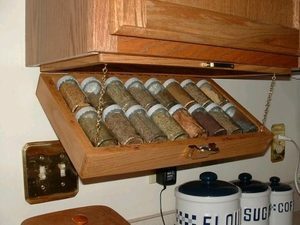 It beats our system – we have all the spices in a storage container, which is a pain when you have to dig out the one you want. 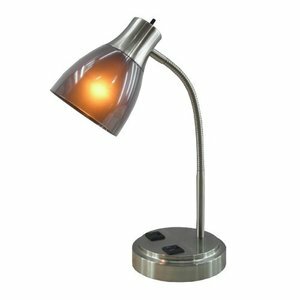 This one’s cool, and affordable. 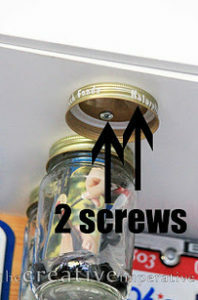 Just get some mason jars and screw them into the ceiling to store small stuff! 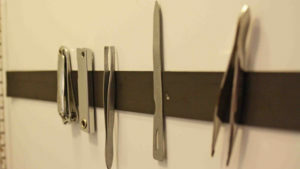 A wall-mounted magnetic strip is high on our wishlist as a way to store our knives. Put them away while driving, though – you don’t want them to come flying off the wall if you crash!! 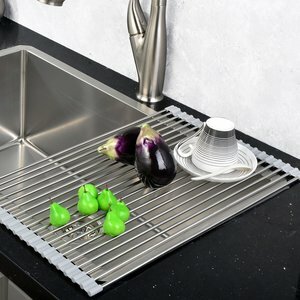 Get some magnets to install on the back of your cutting board, and a sheet of metal to install under your cupboard: Boom, your cutting board is organized and out of the way. 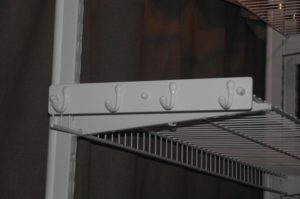 You’ve probably heard of using curtain tension rods in cupboards to keep things from falling out. 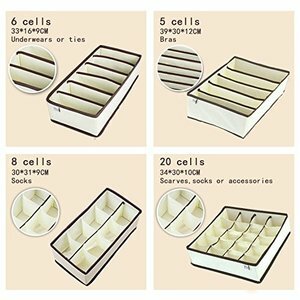 But, have you thought of using them vertically to organize things? Try it out! 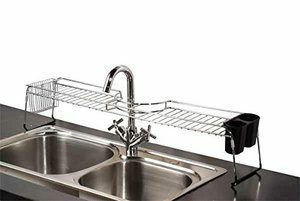 If you can find a way to stabilize it, an over-the-sink rack will add some much-needed kitchen space. Tupperware is one of the greatest things for storing food, but they can be hard to organize, to say the least. 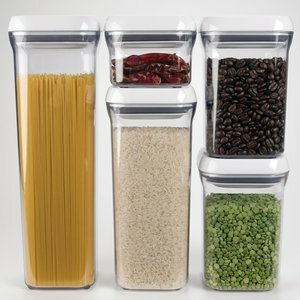 These square canisters (which are also airtight) are great for maximizing your storage space! Like I said, spices can be a pain to organize. These are another item high on our wishlist – spice gripper clips! These are super popular, so I wanted to mention them. 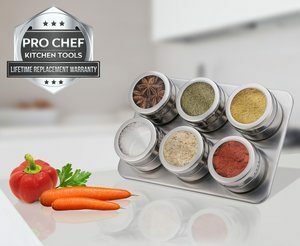 Just be wary of these magnetized spice racks, because Nikki Wynn from Gone With the Wynns said they didn’t work well for her. Maybe she didn’t set it up right, but I’d rather not deal with spice all over my floor to find out. 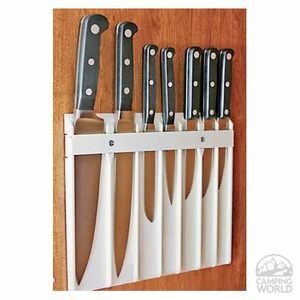 A good alternative to the magnetic strip for storing knives is the knife safe by Camping World. I’m still not sure I would leave them in this while driving, though. 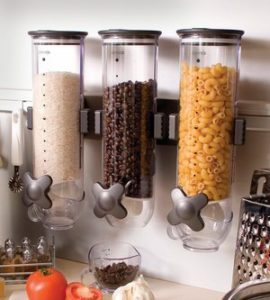 Wall-mounted dry food dispensers are a great way to free up some cupboard and counter space. Just put the contents in and toss the packaging! It makes it easier to get to your food, too. 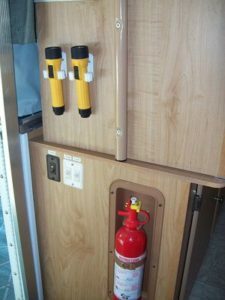 A floating wine rack probably isn’t your first idea to store wine glasses in your RV, but hey, you gotta have dreams of wine, right? If you don’t know what a Lazy Susan is (I didn’t before I did some research on organization), it’s basically a plate that spins (just like the glass plate in your microwave). They are awesome! 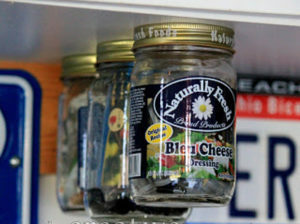 You can use them in the fridge or in cupboards to easily get to stuff in the back. 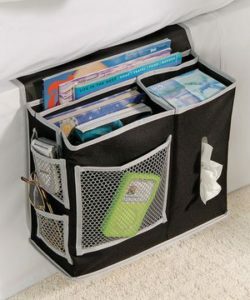 These divided organizers are another great way to save space. 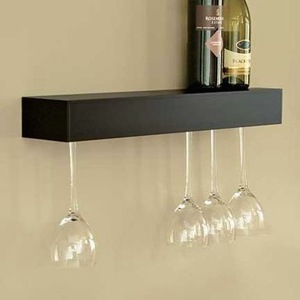 You can store drinkware, clothes, accessories, and more! 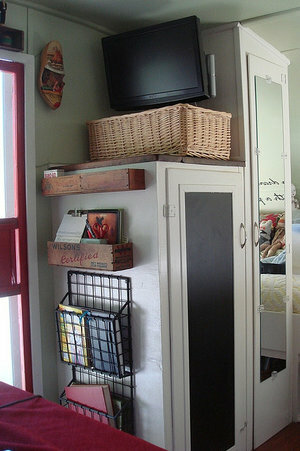 You can create your own with a box and some cardboard dividers left over from packages if you want to be thrifty. Pot lids are the worst things to find space for. They are awkward and never sit right. 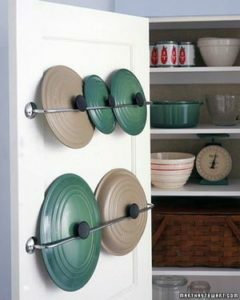 Just use a curtain rod to hold them on the back of a cupboard! 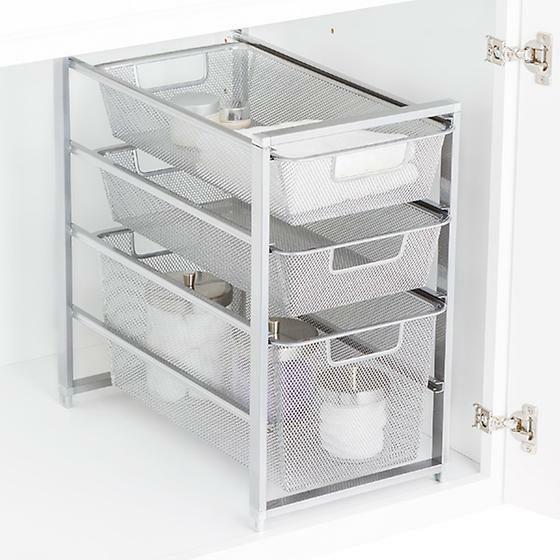 You can use under-shelf baskets to add more storage space to your cupboards – and under the shelves in your fridge! 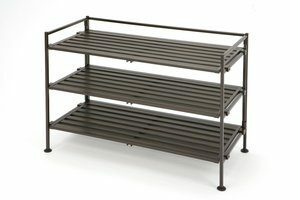 Who says pan organizers are only for pans? Put your baking trays in them, too! 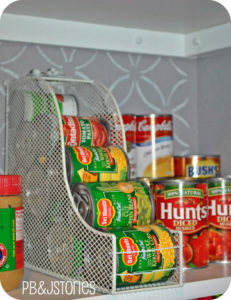 You can use magazine racks to organize the cans in your cupboard; plus, it will stop them from rolling around and making a mess. Sometimes an over-the-door trash can is just too small, and you need something bigger. 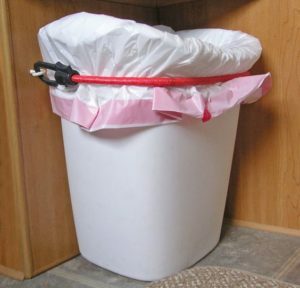 Just take a bigger trash can and use some bungee cords and eye hooks to tie it to the wall; viola, a mobile-ready RV trash can that’s out of the way! 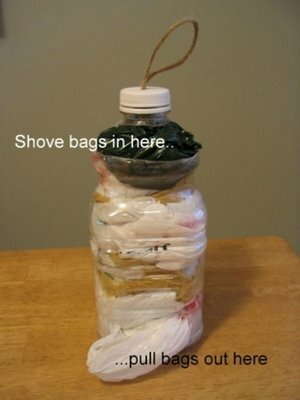 Plastic bags tend to accumulate and take up way too much space. 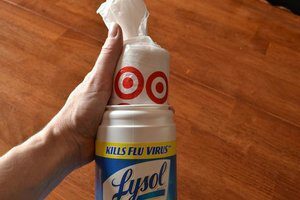 Instead of stuffing them in a dark corner of your RV, use an old wipe container to organize them! If you’re a coffee lover like we are, you’ve probably thrown out a lot of coffee creamer bottles. 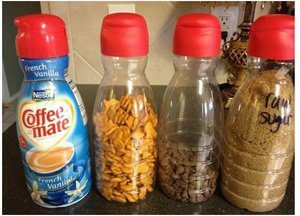 Next time you find yourself running out of creamer, keep the bottle, clean it, and reuse it to store food! It takes up less space than most packaging. Paper towel holders can be used to hold tons of different things. 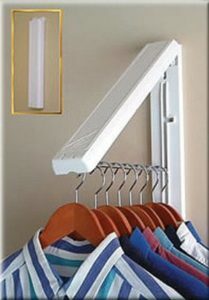 Use them to store your garbage bags for easy access! If you can’t find space for a paper towel rod, an old juice bottle will work to store bags. 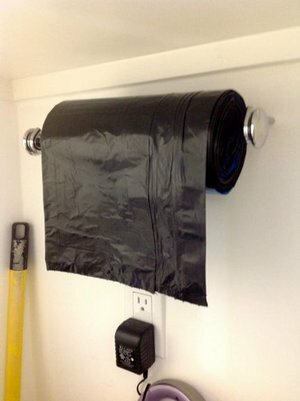 It may not store the whole roll, but it’s an easy way to get your bags out. If you haven’t already figured it out, I love collapsible stuff. 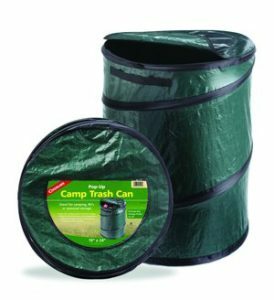 This collapsible trash can takes up virtually no space, and it has plenty of room as an everyday trash can. Thumbtacks can perform miracles. 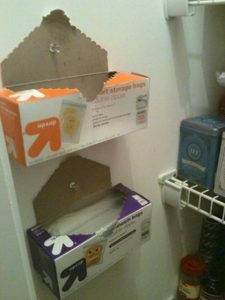 Just pin your sandwich baggie boxes right to the back of a cupboard! 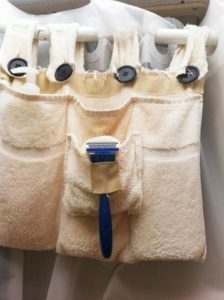 If you’re a creative type, you can combine a towel with some buttons and sewing skills to create one of these cool shower caddies. 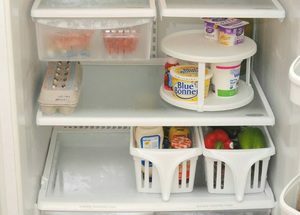 I couldn’t find the plastic containers from Ikea they used in the picture, but you can use these ones from eBay instead. All those creams and ointments can get pretty unorganized if left laying in the medicine cabinet. You can easily store and organize them by stapling an elastic band around them to hold them in place! You can use an old metal coat hanger and some screws to keep your toiletries organized and in place as you travel. 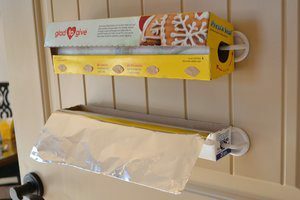 You can take a page out of Anna Moseley’s book and install some hooks in the wall to create an aluminum foil dispenser. 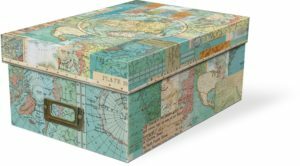 It keeps the box from taking up room on the counter and makes it easy to get to; win-win! 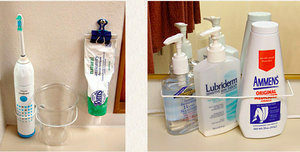 Use command strips to hang plastic toiletry holders! They’re a little pricey, but if you like these extra toilet paper roll holders, you can get them on Etsy. 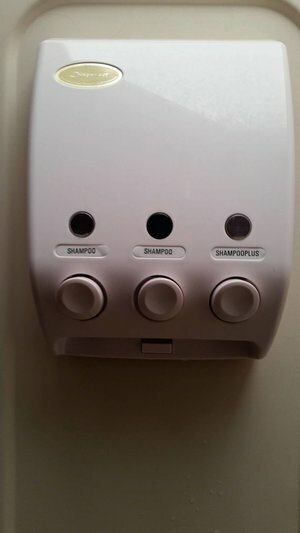 Our RV shower has this nifty shampoo dispenser. There’s a big lack of shelf space in our RV shower, so this comes in handy. 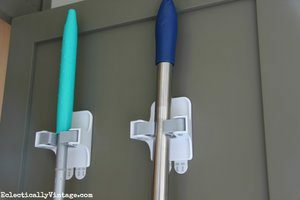 Organize your brooms and mops with a command strip broom gripper. My grandma got us this necklace organizer for Kayla, and she loves it. 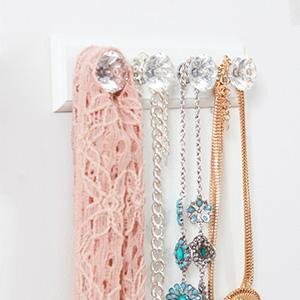 It’s the best way to store her necklaces while also making them easy to get to. 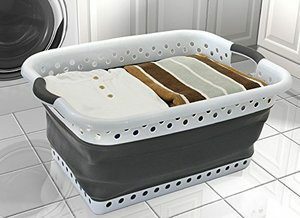 If you need a laundry basket in your RV, try this collapsible one to save some space! Alternatively, you could do what Kayla and I have done and get a laundry bag. Ours isn’t like this backpack version, though – we wish it was! Try out this cool project by Chelsea from Lovely Indeed. 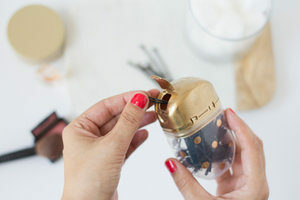 Turn an old tic tac container into a bobby pin holder! 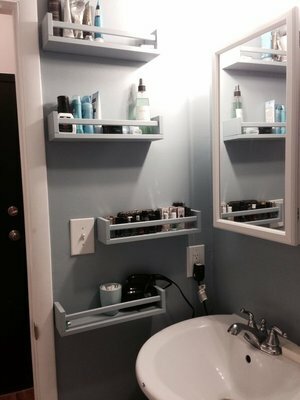 Paint Ikea spice racks to match your bathroom cabinet, then use them as storage shelves for bathroom supplies. 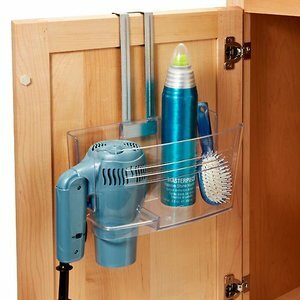 The container store sells this nifty over-the-door hair dryer and supply caddy. You can cut the bottoms of some old coffee cans and tape them together and paint them to match your decor! 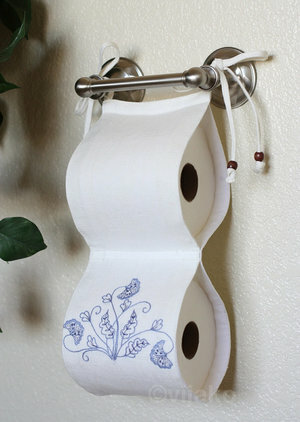 Easy toilet paper storage. If you’re looking for a small, out-of-the-way trash can, use an old dry foods container. 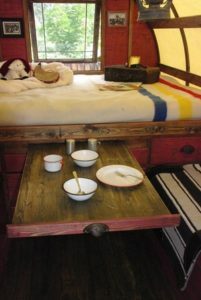 This is a travel trailer space saving idea since most motorhomes don’t have bunk beds. It can be annoying having space used for something you simply don’t need or want there. If you have a bunk bed, but don’t use it, you probably feel the same way. If you’re feeling crafty, try converting that space into an office to get the most out of every square inch of your rig. Keeping good records is really important, especially for those of us self-employed. It can be hard to find room to keep track of this stuff, which is why you should get one of these. If you’re good at stitching, this is an interesting project to undertake. It could double as a shade for the window behind your bed if you have one. Bedroom space is lacking in most RVs (besides under the bed, but who wants to pick up their bed every day?) A caddy night stand could solve that problem for you! Another item given to us by my grandma, these cool decorative shoe boxes make an excellent storage box. 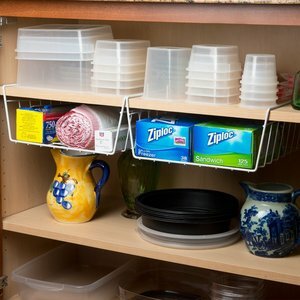 A shoe rack can actually fit in many RV cupboards. Use it for extra shelf space! Kayla and I did this with our remotes, and we love it! We used these velcro squares. 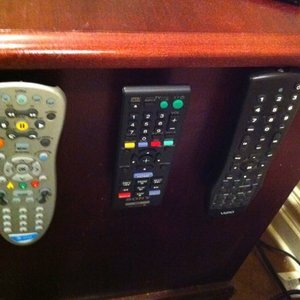 Tired of losing your TV remotes? Velcro them under a table! 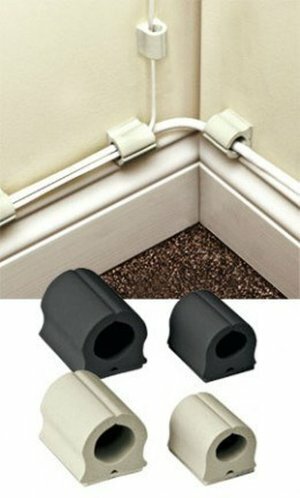 Get another command strip broom holder to store your flashlight by the door for easy reach. I couldn’t seem to find these online anywhere. If you know where to get them, let me know! 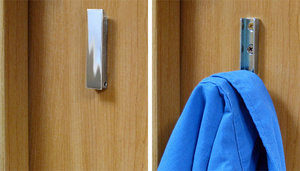 Hide your coat or towel racks using door catchers. 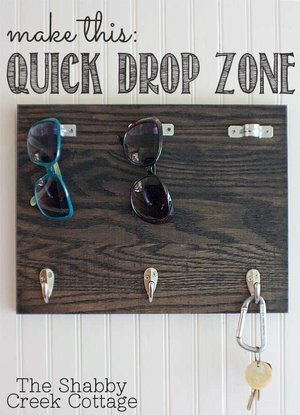 Create a “Quick Drop Zone” to store small things like keys and sunglasses right by the door for easy access. 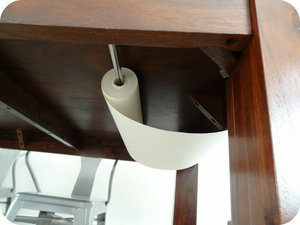 If you have kids who like to draw on paper, try this project to install a paper roll under a cabinet. This is something you can easily make yourself, or you can just buy it. 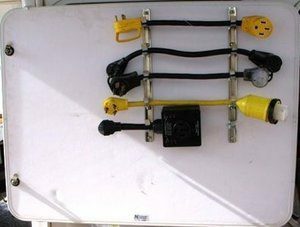 This tip is less for organization and space saving, and more for supplying your RV with a power outlet you can reach without bending over. Our RV has a power outlet under the dinette we use when we’re working on our laptops, and it is a pain to get under there to plug stuff in. This is another idea we got from Gone with the Wynns. Sticking with our theme of not putting holes in the walls, these peel and stick cord organizers are great for making your cords look pretty. Most of your cords are hidden anyway, but it’s always nice to see cords actually organized. 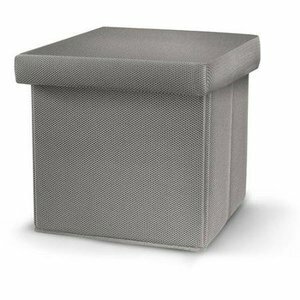 Collapsible ottomans are great for adding extra storage and utility. Plus when you’re not using them, you can put them under the dinette or fold em up. Our current RVing neighbor has a tow cargo carrier attached to his fifth wheel for extra space. 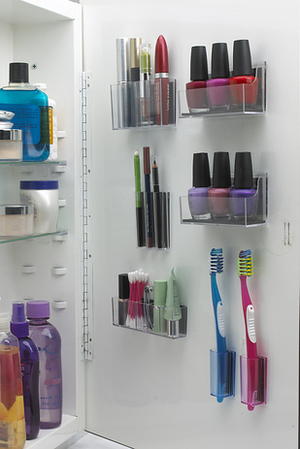 Sometimes the best RV storage ideas are the ones that simply add more space to store things! 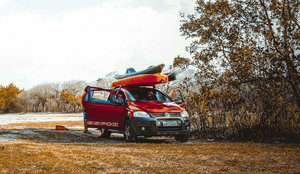 You can put kayaks, bikes, extra storage and more in your tow vehicle. Make the most of it! 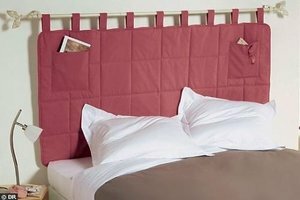 One way to do this is by hanging nylon velcro strips. 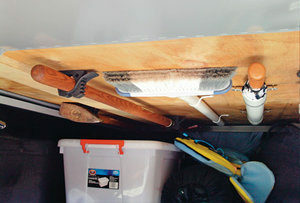 Use pipes and brackets to mount supplies like brooms, umbrellas, fishing rods and more to your outside storage ceiling. 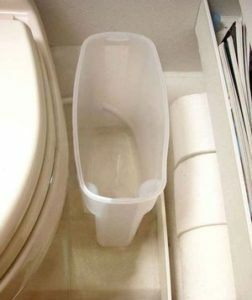 Another tip that isn’t exactly for storage, but more for convenience. 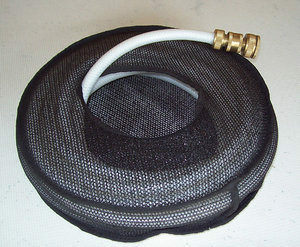 Easily wash your RV, clean your black water tank, or whatever you need an extra hose for. Get one here. 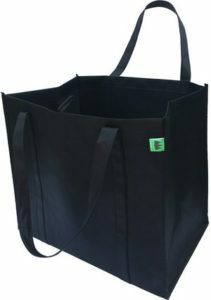 You can use these for groceries (duh), but you can also use them to store extra stuff in. We have a bunch of cleaning supplies in one of ours. You can get them at most grocery stores or on Amazon. 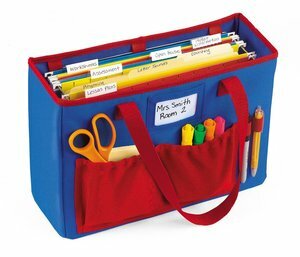 We have more space saving ideas but weren’t sure which category to put them in or didn’t want to make a separate category for only one or two things. Here they are! 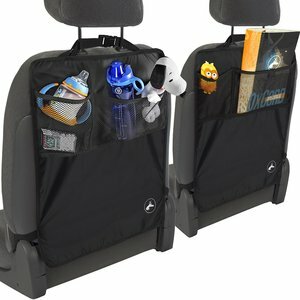 Who says you can’t use your motorhome’s seats as extra storage? Get one here. We wish we had more pull out surfaces. 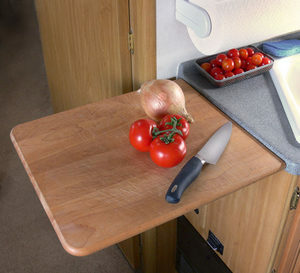 Hidden counter space is one of the best RV storage ideas you’ll ever head. You can build some if you’re interested in DIY. We LOVE command hooks. 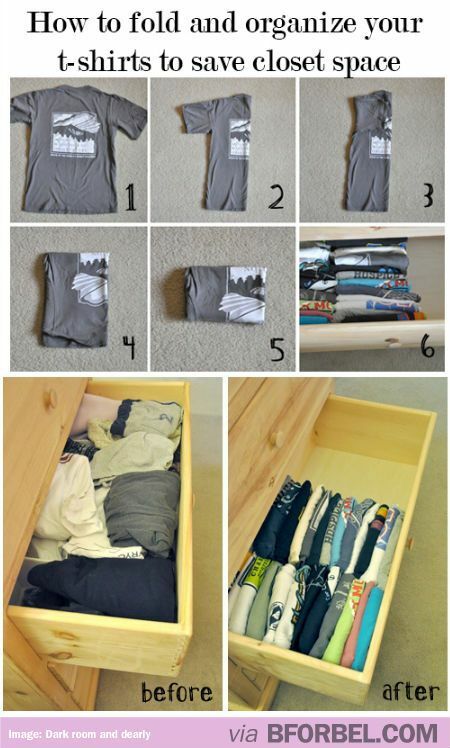 They are a super easy way to organize your stuff and save cupboard space. 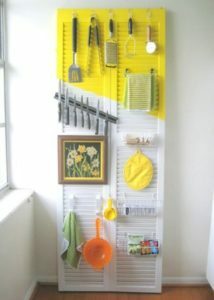 Check out DIYncrafts awesome guide to using command hooks for some great ideas! These insta-hangers are pretty cool. 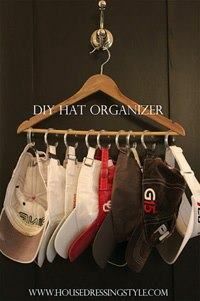 You can use them to organize the clothes in your closet, or to hang up your nice outfit while you iron it. When you’re done, they snap down and hide away! 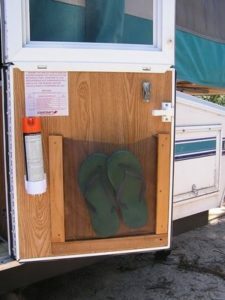 This is one of my favorite camper storage ideas. It lets you get really creative! 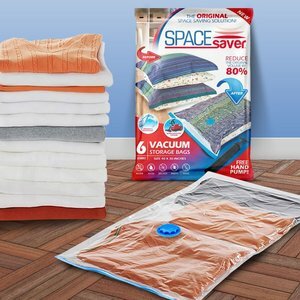 If you’re bringing extra pillows, blankets, or clothes with you in the RV, these vacuum-sealed bags are an excellent way to keep them fresh and save space. 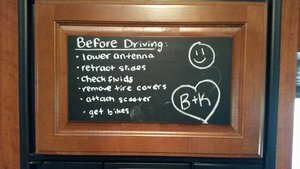 We used chalk paint on our fridge to help us remember what to do before we pack up and drive. You need tools if you’re going to spend time in an RV. 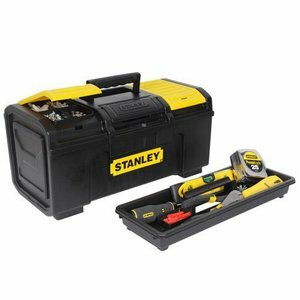 You never know when something’s going to break – I’ve used my toolbox 5 times in the past week alone. Check out Ditching Suburbia’s fulltime RVer’s toolbox article for tool ideas. DVD cases take up a lot of space. 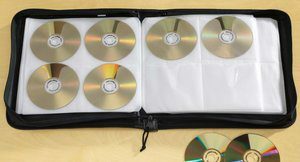 Ditch the cases and get a DVD/CD binder instead. Instead of using your precious storage space on a DVD binder, download all your movies onto an external hard drive (here’s a guide). You can also keep all your music on there (or just use Pandora). Heck, use an e-reader or kindle instead of carrying physical books, while you’re at it! We’ve found there to be a near endless use for tension rods. 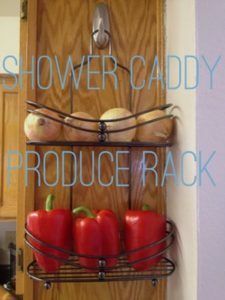 You can hang spray bottles on them, hang baskets on them for extra storage space, or use them vertically to organize stuff. 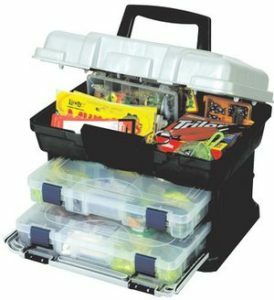 Tackle boxes aren’t just for fisherman. You can store all kinds of odds and ends in them! 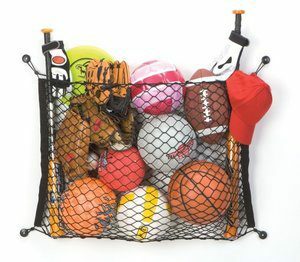 If you’re into sports, it can be difficult to find a place to store all your equipment. Try installing a storage net! 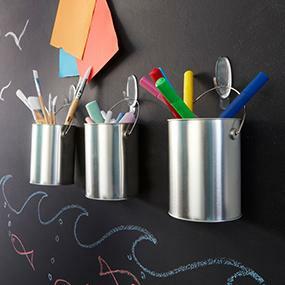 Magnetic tape can be super useful for storing small metal objects on the wall. 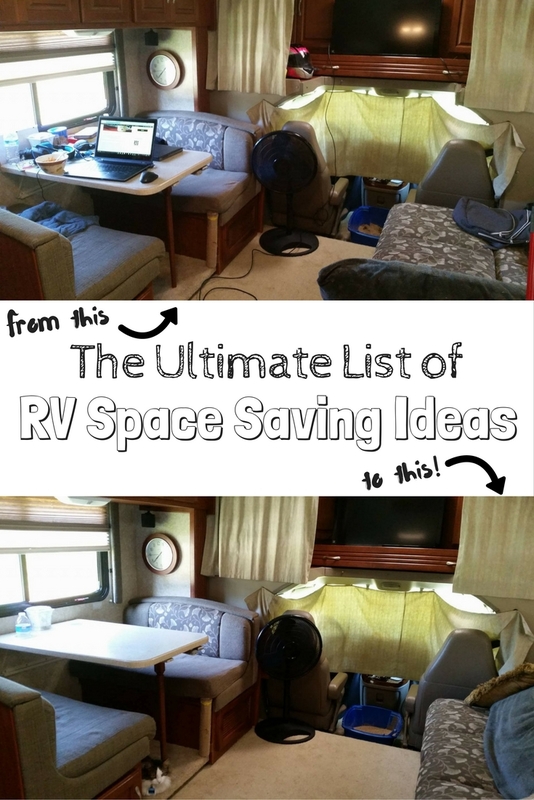 There you have it – the ultimate list of RV space saving ideas! If you enjoyed this article, please share it so we can help more people save space. What are your favorite RV storage ideas? Let us know in the comments below! Can’t get enough RV gadgets? 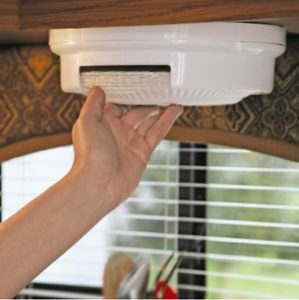 Check out our full list of must have RV accessories, as recommended by over 30 full-time RVers!